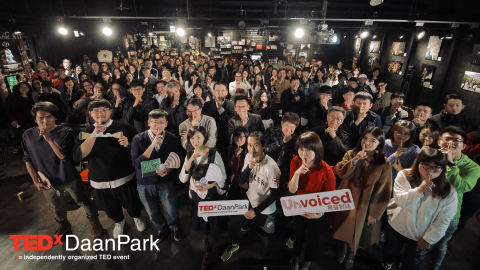 TAIPEI, Taiwan--(BUSINESS WIRE)--TED, an organization that seeks to change the world with ideas under the slogan “ideas worth spreading,” has selected Taipei, Taiwan as one of the five cities to hold TEDxWeekend in 2019 to celebrate its 10th anniversary. Over the past years, TED has connected communities across the world through holding TEDx events, establishing an online platform that has captured over billions of views. Dr. Luke Lee, TEDx Ambassador and Organizer of TEDxWeekend noted that TED has utilized the power of decentralized web to develop citizen participation through bottom-up approach, making it an example of the best practice of digital innovation. Taiwan, meanwhile, has become a facilitator and place where ideas are turned into action. The upcoming TEDxWeekend has received positive responses from enterprises and public sectors. Hochen Tan, former Minister of the Ministry of Transportation and Communications, said Taiwan society, which allows openness and diversity, has helped enriched and promoted TED. The geographical competitiveness also allows Taiwan to bridge the information, communication, and technology of Northeast Asia as well as economic benefit generated by the ethnically diverse population in Southeast Asia. Taiwan looks forward to diverse conversations through combining civilization of Asia continent and Taiwan’s oceanic culture, added Hochen. Chairman Jan Hung-tze of PChome Online Inc. and the Digital and Innovation Working Group of APEC Business Advisory Council pointed out TED demonstrates knowledge sharing, collaboration, and participation through cross-field sharing, enabling ideas, thoughts to be heard and practiced, and creates chance and space for minority to achieve equality. Culture Minister Cheng Li-chiun noted that digital technology influences tools, economy and brings opportunities and challenges for Taiwan and the world. She believes TED will show the integration of innovation and creativity, and helps strengthen ties between knowledge communities in Taiwan and that of overseas. When facing disruptive innovation of digital technology that brings impacts on economy, society, and life, the government, enterprises, and employees have to gain a deeper understanding about “disruption” and push for reforming policies to seize opportunities, said Minister Dr. Chen Mei-ling of the National Development Council. This way, applications of digital technology could be widely accepted and further to achieve inclusive growth of digital economy. TED will make significant contribution in terms of finding a better balance between technology and humanity, added Minister Chen.